Question: I am the sole caregiver for my wife. I am 77 years old and fit, but had a heart attack about 8 years ago. My wife is hemiplegic (right side paralyzed). She had a colectomy and vaginal fistula. She has to go to the toilet to defecate 10-15 times a day. Because of the fistula, she has to wear a pad which has to be changed often. Of late, she is unable to transfer from the wheelchair to the toilet. 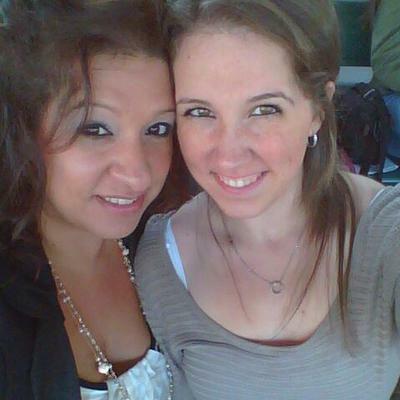 I have to support her to transfer. Is there any equipment available which will make transfer easy? Answer: They make toilet lifts which might help you with the transfer as long as you are strong enough to turn her to the chair. The good thing about the lifts would be that you could elevate your wife above the toilet to help clean her, and you wouldn't have to do the lift from sit to standing. I personally do not have experience with toilet lifts so I can't say how much of a help it would be or which one is best. however, if she is having to toilet that frequently. I do have experience with hoyer lifts and though they are not difficult to use, I think it could be very cumbersome trying to use one multiple times during the day plus they're bulky and might not fit in the bathroom. Whatever you decide to use, you need to look into insurance paying for it as well as getting the physician to write a prescription for the equipment you need. I would talk to the company who provides the lift to find out how to get insurance to cover the product. Below are two examples of toilet lifts (one cheaper and one more expensive) as well as a hoyer lift. You might be able to find other options as well by searching online for toilet lifts or toilet transfer lifts. I also recommend getting the physician to prescribe therapy to help your wife improve her transfers especially if she has experienced recent decline. You could have a therapist come to your house. I don't know a lot about fistulas, and I'm sure you've seen her doctor, but I would definitely ask about options for getting it fixed or seeing if a permanent ostomy bag might be an option (again not my area of expertise so don't know if this is an option). The products below are some examples of lifts. 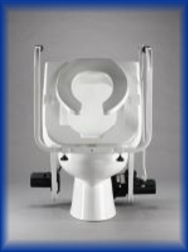 The best toilet lift on the market is the LiftSeat Independence. 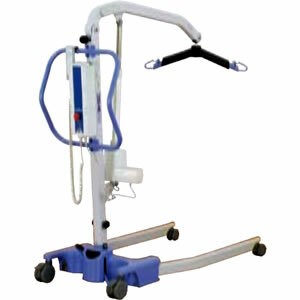 They manufacture product for hospitals, nursing homes and homecare. I strongly recommend you look at this product. I am a physical therapist who is currently working with tumor removal patient who would benefit from the table top with small legs for gravity lessoned hip ext/flexion and knee flex/extension. Do you know where I could find one. THanks so much. If so, just do a Google search or image search for powder therapy board to find where one is available. One Handed or One Arm Drive Wheelchair? Question: Does someone make a wheelchair in the USA that can be operated with only one hand (not a motorized one)? Answer: One arm drive wheelchairs are designed for individuals to drive using one arm. One needs to have good coordination and strength in the arm that will be used to operate the wheelchair. The one arm drive wheelchairs can use either a double rim or lever system. A double rim system has two handrims located on the same side that control the rear wheels. The outer handrim controls the wheel on that side of the wheelchair and the inner handrim controls the wheel on the opposite side of the wheelchair. You must use both rims at the same time to propel straight forward or backward. To turn the wheelchair, the user pushes the handrim that controls the wheel on the opposite side of the wheelchair or pulls backward on the handrim that controls the same side of the wheelchair. There are also lever one arm drive wheelchairs, but I am less familiar with those. If you contact a dealer, and they are unfamiliar with the one arm drive system, I would contact the manufacturers directly. Comments for One Handed or One Arm Drive Wheelchair? Question: My wife suffered a stroke in June and has been in wheelchair since. I got her a stationary bike which has helped a great deal. She can now with a walker make it about 50 feet. I don't want her to over do it. I was wondering after she gets stronger, would a rowing machine be good for leg strength? Thank you. Answer: Rowing machines are good for leg strength, however, the question would be is your wife capable of using a rowing machine safely without injury. Some stroke patients who have gone through recovery may very well be able to use a rowing machine whereas many would not. It all depends on the amount of movement/range of motion and strength that your wife possesses. If your wife improves to the point that you think she could use a rowing machine then I would make sure she is able to actually try one out first before a purchase was made. If she has had a therapist involved in her care, you could consult with them for their opinion as well. I'm not sure where one could try out a rowing machine, but my guess would be possibly a fitness center or sporting goods store. I am 7 months post stroke left arm about 10% use left leg 55% use with afo brace. Use to row before stroke. Actually gave it away after stroke, people nice to give it back for recovery use. For me, I can row about 500 meters- 1,00o with breaks. Over the course of the day 3,000-5,000 meters. Pretty good. Helps strengthen my core maybe my arm. Psychologically, helps me feel I trying to improve. 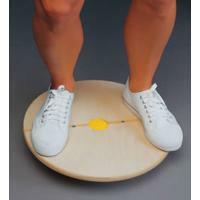 Where to buy the pedal exerciser and other stroke equipment? 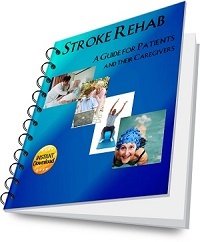 Question: I'd like to buy some home equipment for stroke patients. Please tell me where to order online or to buy (I live in Orange County, California). Thank you. Answer: One website that I have found to have good prices for home equipment is ActiveForever.com. They have been featured on Oprah before, and their prices are better than most websites I have visited. Before purchasing any equipment, I suggest doing an online search for the equipment you want and then comparing prices on various websites. An online search for specific equipment will pull up multiple merchants, and then you can pick which one has the best pricing. Question: Before my stroke 4 years ago, I was going to the gym 3 to 4 times a week. I often wore a fit bit on other days. After my stroke, my walking was so slow my steps didn't register on the fit bit. I want to start a walking regime to build up strength and help with my balance issues. I liked my fit bit as it motivated me to move. Do you know of a device made for stroke survivors that is more sensitive, so as to register lighter movements? Answer: According to research, Fitbit is 94 percent accurate or greater at walking speeds as slow as 0.4 m/s. It's not a matter of registering lighter movements but speed of movement. A suggestion was to wear it on the ankle to get better results. If wearing it on the ankle does not help, then I would just keep an eye on research and latest technology as there are people out there trying to create technology that is more accurate for persons with disabilities. I personally do not know if there is a product out there that registers steps when walking speed is below .4m/s. Question: I had a stroke Oct 3, 2015. I am regaining use of my left side. I bought a recumbent bike but the pedals are too small to work. My left knee is very week and I have a custom AFO. What bike would you recommend? Also, I use a Bioness at therapy and would like to know how much they cost? I would like to approach my insurance about it. Answer: A recumbent bike is a good choice. Maybe you could have someone adapt the pedals so that they better fit. Many people use straps to hold the weak leg in as well. Bioness units cost thousands of dollars (I do not know the exact current price). You could contact Bioness from their website and ask. Some insurance companies cover Bioness and others do not. You could also check into renting it. Question: I had a stroke in 2014- My arm has not really returned. My daughter is adopting two infants and I want to be able to hold them. What sling or baby holder would be best. The stroke affected my balance so I will not walk around with it on. Not yet. Perhaps I could practice with a 10 pound bag of potatoes in the sling. do you have any suggestions. Answer: I'm not sure which type of sling would be best. I would Google baby sling or adaptive baby sling and click on the Images section of Google to see what you think may work best. Be aware that certain types of slings are more dangerous especially for small babies so you might want to research baby safety and slings to find out which slings are not recommended. Another way to find resources is to search one handed parenting or parenting with disabilities which will lead you to some sites that may have information that will help. These sites often have forums as well so you could post your question there and probably get answers from disabled parents that have faced a similar problem. 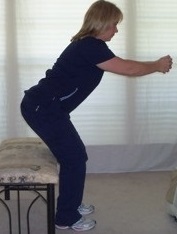 Is the tush push a tool covered by insurance for patients with broken bones? Question: My 80 year old mother broke her collar bone, two ribs, and her fibula and tibula. She can't bear any weight on her right side. We can't afford to continue paying private pay and because she has plateaued (until she can bear weight), the insurance would like to send her home. It is important to us that she isn't teatering on the one good limb that she has left. We were told about a tension pole that may help stablize her when she transfers to the toilet but she is weak and the tush push looks helpful as well. Do you have any suggestions and do you think the insurance may help with covering getting the tush push as an assistive device? Answer: I would contact the manufacturer and see if there are any solutions for getting insurance to cover their device. The name of the company is Phillips Lift Systems, and their contact e-mail is toiletliftchair@yahoo.com, and their phone number is 1-888-429-5438. The only thing I saw on their website (http://www.toiletliftchair.com/) about insurance coverage was on a brochure and was for Medicaid patients. Question: Is there a standard size wheelchair that my husband can propel with his feet & possibly his right hand? Someone gave us an adult size wheelchair but it has quite large back wheels which is difficult to position in our bathroom especially to help him more safely transfer from the toilet back into the wheelchair. He is 6'1" tall weighing 190#. Question: Looking for a hand arm bicycle. Her left hand is just starting to show movement with the thumb and pinkie, so she cannot grip. Is there anything I can use to secure her left hand onto a hand cycle so she can move it around in circles. Please advise. Answer: Ace bandage usually works well. Just make sure the hand is securely wrapped and that the movement of the bike is not painful to the hand/arm in anyway. Make sure the pedaling is controlled and not causing the affected arm to be flung around.